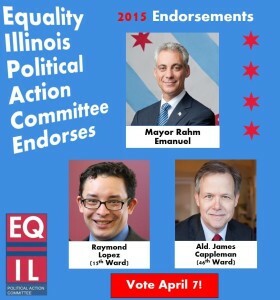 The Equality Illinois Political Action Committee (Equality Illinois PAC) today reminds voters of its endorsement of the re-election of Mayor Rahm Emanuel. The Equality Illinois PAC also recommends votes for Ald. James Cappleman (46th Ward) and candidate Raymond Lopez (15th Ward) in Chicago and Springfield Alderman Cory Jobe (6th Ward). In reiterating the endorsement of Mayor Emanuel in the April 7 runoff, Nicole Bashor, Chair of Equality Illinois PAC, said it is important for the community to stand with incumbents who expended personal and political capital to support significant issues that have improved the lives of LGBT Chicagoans throughout the city.